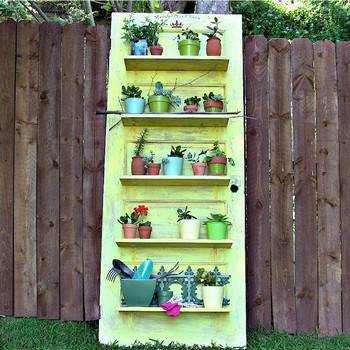 If you've ever put an old door atop a pair of sawhorses for an impromptu table or workbench, you know just how handy that piece of lumber can be. 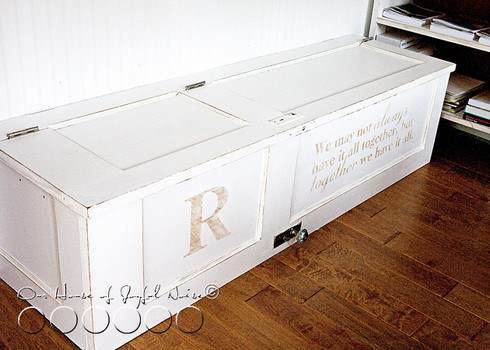 Why not take it to the next level with our great collection of furniture projects that are made with repurposed wood doors? 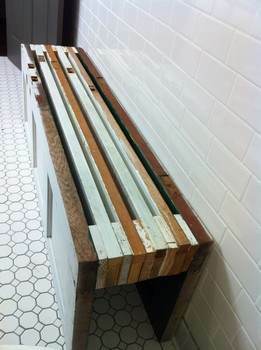 This great source of lumber is perfect for creating a shabby-chic headboard, bench, table or bookcase. 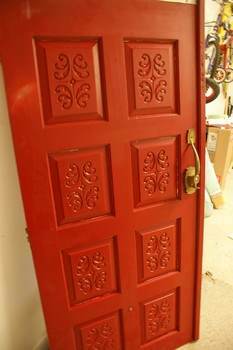 Old doors are inexpensive or free for the taking, and they've become a popular way to add character to simple woodworking plans. You'll find the perfect idea for your next woodworking project when you check out this extensive collection of repurposed wood door plans and designs. Our projects can be adapted to fit your style and the type of doors you choose with instructions and tips to convert any door into a lasting piece of furniture. 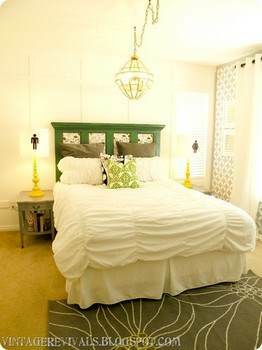 Re-purpose a door by turning it into a unique and attractive headboard with little time and money. 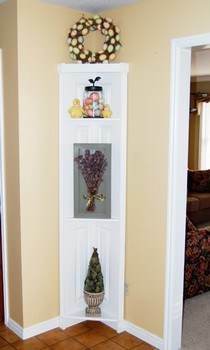 It's easy to turn an old door into a charming hall tree with storage bench, metal hooks and a top shelf. 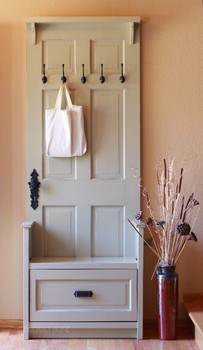 Build this unique coat rack with attached storage bench using a single door, some lumber and coat and hat hooks. Here's a plan for a charming bench built using an old wooden door with chipped wood or distress it yourself for that cottage chic style. 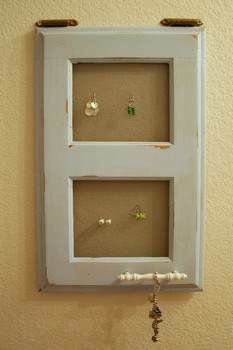 This project turns a cabinet door into a wall-mounted jewelry holder with just a little paint and a salvaged window screen. 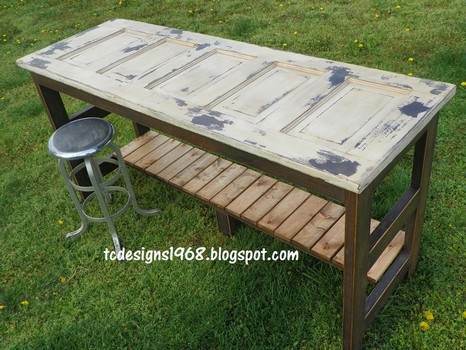 With just a little money and time you can build a distressed kitchen island out of an old wooden door and a few pieces of wood. 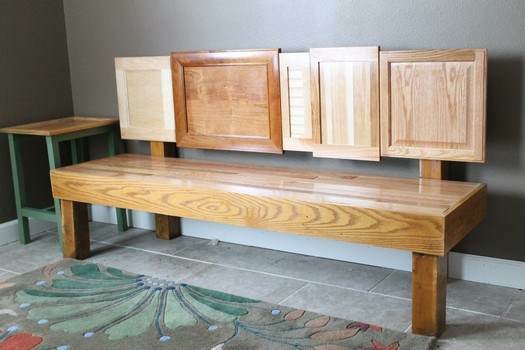 This plan will help you build a handsome storage bench out of doors. 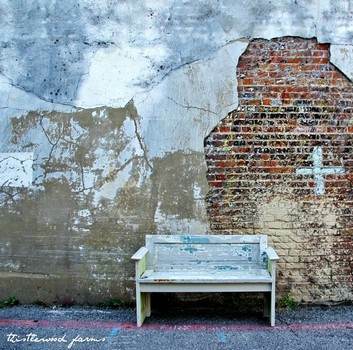 Once completed, the bench can be personalized to your taste. 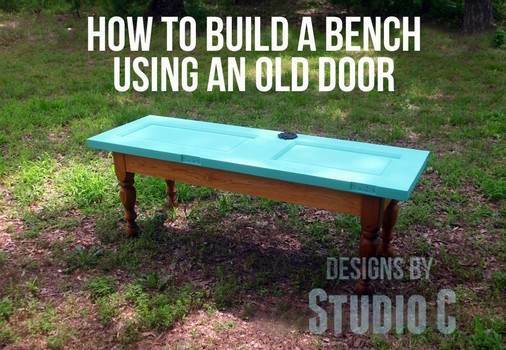 Two hollow-core doors were used to build a strong and sturdy bench for indoors or out on the deck, patio or garden. 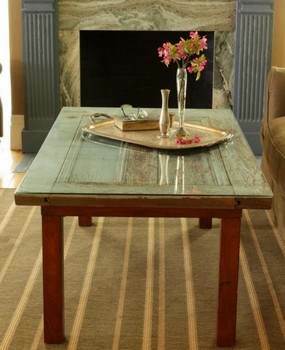 You can easily re-purpose a wooden door just by adding four legs plus paint or stain for a great coffee table for the home. 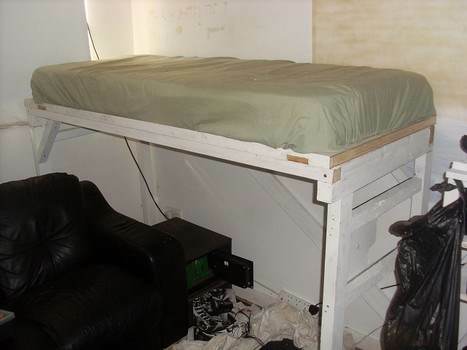 Build a loft bed using old doors; it's the perfect and inexpensive solution when needing a bed in a small space. Create this stylish door-table with wooden legs that are slanted out for a sleek and modern look. 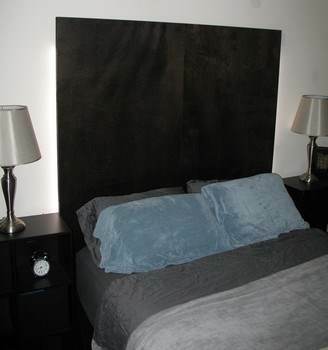 Make an attractive tall headboard using 2 stained or painted solid wood doors and some anchoring cement. 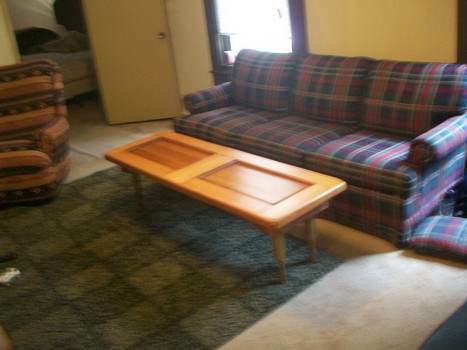 This plan takes an interior door and trims the sides with 1 x 4's for a lightweight table for inside or outside the home. 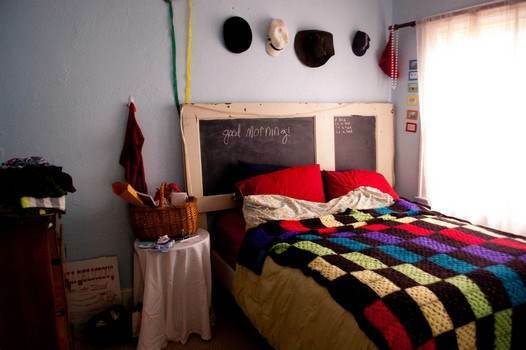 Replace the panels of an old door with chalk board to create the perfect headboard for a kid's or teen's room. 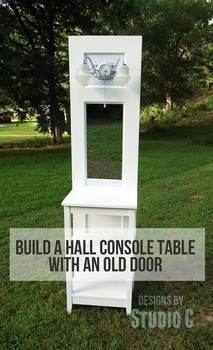 This plan turns a 100 year old door into a beautiful dining table that fits in with most any style or decor. 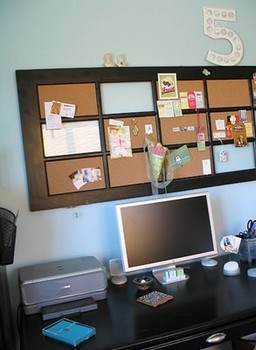 Turn a window pane door into an awesome inspiration board for pinning pictures, reminders and more. 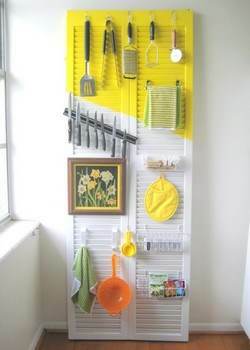 Paint a folding louver door then add some hooks to place such kitchen items as measuring cups, hot pads, tea towel, a piece of art and more. 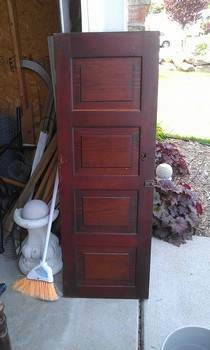 This plan takes an old door and strips off the old paint, sands it and stains it to create a handsome headboard for the bed. Mount the frame of an old door to the wall then add some cup-hooks to support wooden dowels for the perfect gift wrap holder. 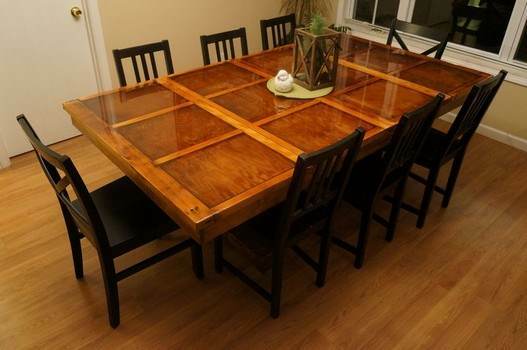 You can make this beautiful dining table using an old wooden garage door that has been cut down then stripped and stained. 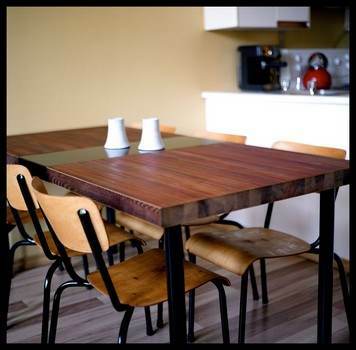 Detailed instructions are here to help you build a dining table using a re-claimed door and few supplies. 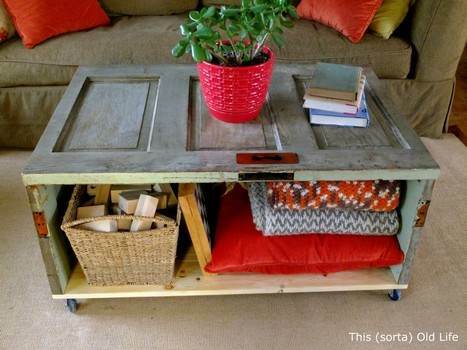 Using a single wooden door you can create this attractive coffee table with storage for pillows, games or other miscellaneous. 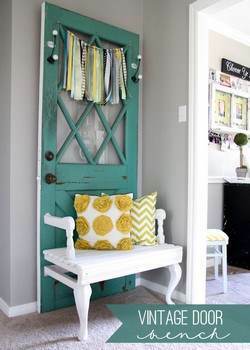 Create a hall tree to be proud of just by re-purposing two shutters and a louvered door with metal hooks attached. 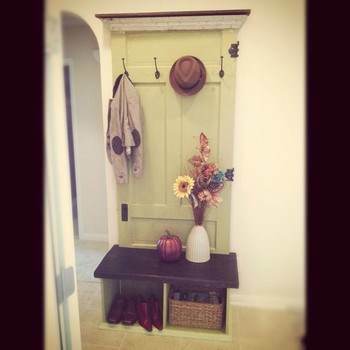 Use this project to re-purpose a cabinet door into a coat rack that can be painted or stained to match your entryway. 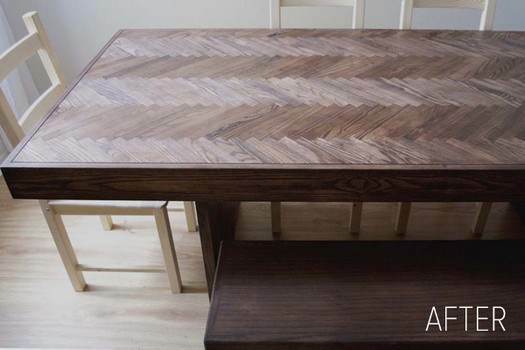 For approximately $150.00 you can build a beautiful herringbone dining table out of ash wood strips and a single door. 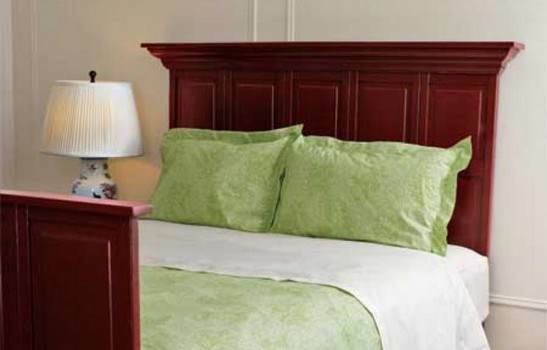 This plan will get you creative with paint colors and prints by building a headboard out of wooden door. 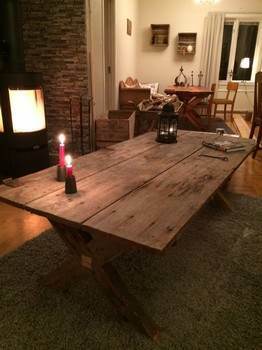 Just by laying an old door on a four legged base then laying glass on top of that you can create an awesome coffee table. You can create this unique corner shelf by cutting a single door in half length wise and keeping the door knob intact. 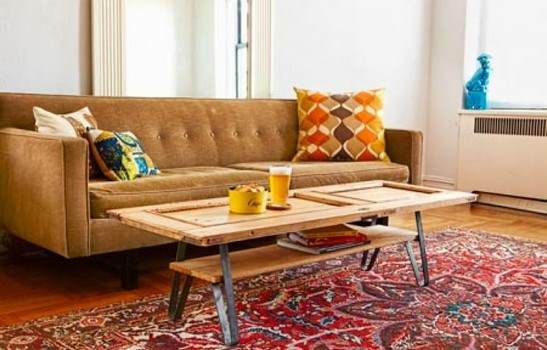 This plan makes a modern coffee table out of an armoire door and metal legs at a low cost and with little effort. Using bi-fold doors that are paneled and some attractive molding you can create this stately looking foot and headboard. 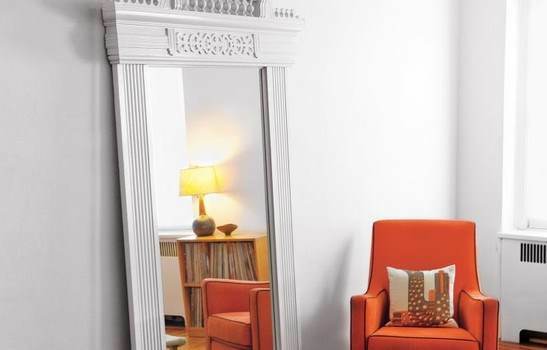 This step by step plan turns an old door into a charming stand-up mirror that will add visual interest to any room it's placed in. Re-purpose and cottage style door by making it into a dressing vanity by adding metal hooks, mirror and a shelf. 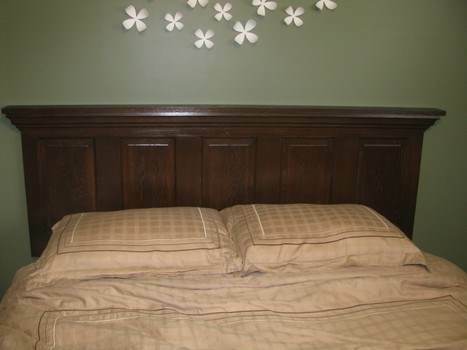 Take a solid wood panel door and with the use of the easy to follow plan turn it into a handsome headboard for the bedroom. 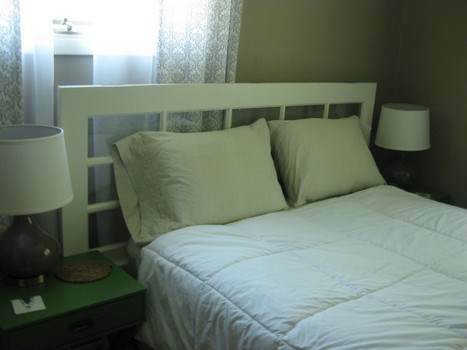 Create this charming cottage-chic daybed using a couple of old doors, four legs, a mattress base and a twin mattress. 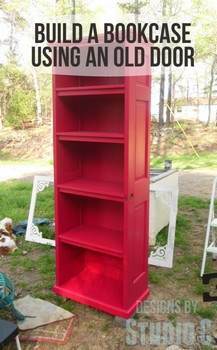 Build a beautiful corner bookcase out of a door using little time and money with the help of this simple project. 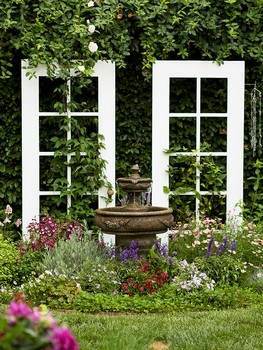 Re-purpose a paned door plus add charm to your garden by creating a charming trellis for a climbing plant to attach to. 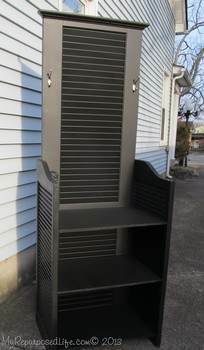 You can easily turn a folding closet door into a lovely corner shelf to add to a dining room, kitchen nook or wherever. 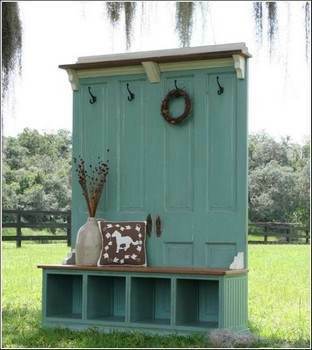 This project uses an old door for the backrest to a bench seat and metal coat hooks are added for the perfect addition to an entry or mud-room. 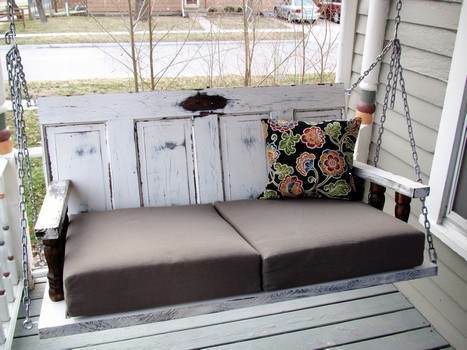 This cottage-chic porch swing was built using two old doors and a few pre-made chair legs for the arm rest. 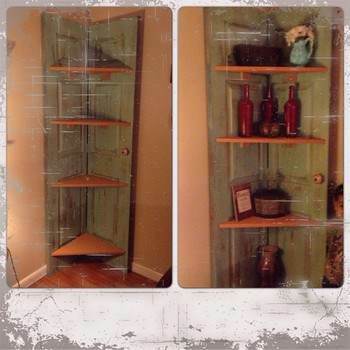 Using inexpensive doors bought at a flea market this attractive bookcase cost only $45.00 and was fun to make. 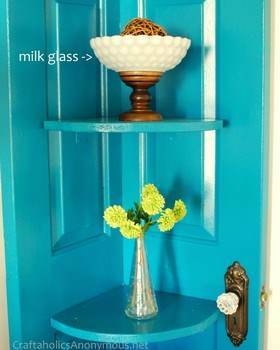 Leave the vintage door knob on a single distressed door to create this unique corner shelf to add to the style of home or office. 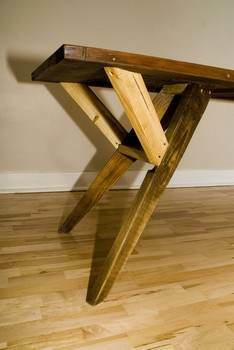 Turn a narrow door into a lovely display table by adding a light fixture and a table made from a few pieces of lumber. 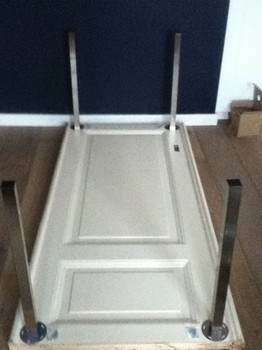 Re-purpose a narrow door just by adding legs and an apron for a charming bench for the garden or inside the home. 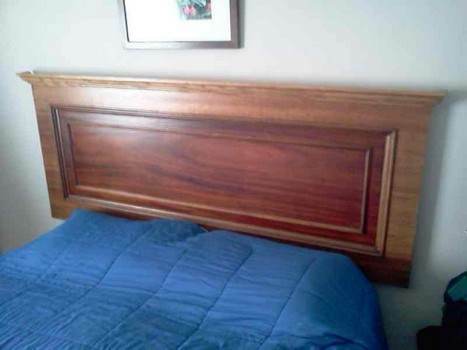 You can make your own headboard is a single day using this plan an old wooden door plus some crown molding. 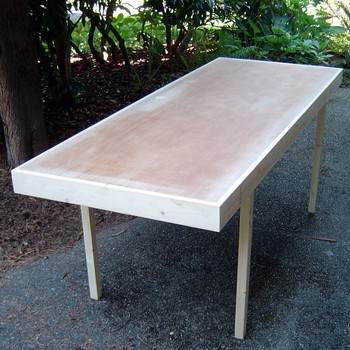 Here's a clever way to re-purpose a folding table by discarding the table top and in its place add a hollow core door. 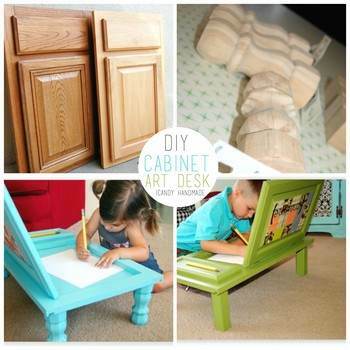 Get creative by turning a cabinet door into an adorable art desk with just a little paint, a couple of legs and a little time. 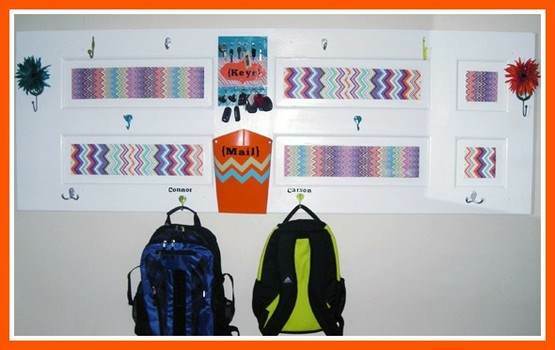 Use an old paneled door to make a wall mounted coat rack with metal clips attached to display your favorite photos. 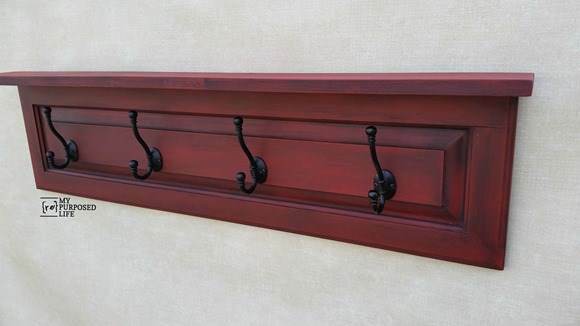 Bring color and storage to an entry way by building a coat rack with an attached bench and an open storage area. 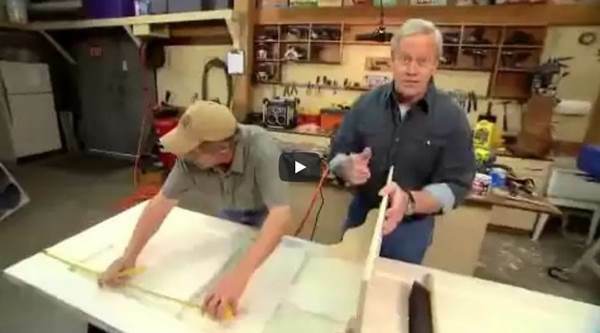 Here is a detailed video that demonstrates how to make a handsome desk for the office or home out of an old door. 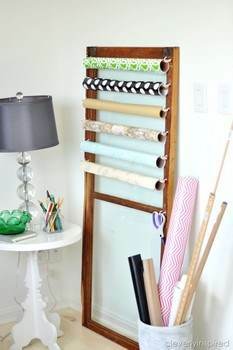 Use this step by step plan to make an attractive room divider that once built you can add your own personal touches.